Calcium is the most plentiful mineral in your body and is vital to your health. When you think of calcium you probably associate it with strong bones, as you should. About 99% of the calcium in your body is stored in bones and teeth, helping to keep them strong and hard. Your body uses bones as a storage tank for calcium and will take it as needed to maintain consistent levels of calcium in the blood, muscles, and intercellular fluids. The other 1% of circulating calcium is tightly regulated by parathyroid hormone and vitamin D. Even in small amounts, the other 1% of calcium in your body plays a vital role in nerve signaling, metabolism, hormone secretion, normal blood clotting, muscle contraction, and maintaining pH balance, normal heart rhythms, and blood pressure in the body, plus more. The “Got Milk?” advertising campaign was successful in getting many Americans to believe that if you drink milk, your bones are taken care of. But, that might not be enough. If you think that drinking milk and eating cheese is all it takes to get enough calcium from the diet, there are a few things you should know. Europeans and Americans are among the world’s biggest cow’s milk consumers and yet account for over half of the world’s fractures. Conversely, the lowest fracture rates occur in Asia and Africa where lactose intolerance is rampant and milk consumption is infrequent. Clearly, milk isn’t the only way to get calcium from the diet – and for some people, may not be the best way either. The Standard American Diet consisting of ultra-processed convenience foods and an abundance of sugar isn’t providing us with the calcium we need. The sad truth is that even if you eat whole, organic foods, the soil is becoming depleted of precious minerals including calcium. Furthermore, certain factors can challenge calcium absorption, such as rampant vitamin D deficiency, using thyroid or acid reflux medications, phosphorus consumption (think animal protein and carbonated beverages), the tannins in coffee and tea, oxalates and phytic acid in foods, all challenge calcium absorption. Furthermore, the drop of estrogen after menopause, the nutritional demands of pregnancy, high caffeine intake, sugar, low frequency EMF, stress, acidity (too much exercise, sugar, coffee, and carbonated beverage consumption), and NF-kappa B from the immune system can actually deplete calcium from bones, even if you are getting enough from your diet. Any of these sound familiar? These are the exact things our modern lifestyles offer! Even those who eat the healthiest diets may not be getting the calcium they need for strong bones because of these factors. Calcium is often given little thought until there is a concern with bone strength later in life, but calcium is needed by everyone throughout life. In fact, new bone formation is at its highest during growth periods in childhood and adolescence and getting enough to fortify bones at that time is crucial for later in life. In early and middle adulthood, the process of breaking down bone and building it back up is about equal, but later in life bone may begin to break down faster than it can be built back up. Don’t wait for a fall or a break later in life to start fortifying your body with this essential nutrient! The time is now. How Much Calcium Do We Really Need? Since calcium is so important for health, it is essential that we get enough from our diet every day to build up bones, our calcium reservoirs, for later in life. The current RDA (recommended dietary allowance) for women age 50 and younger is 1,000 mg of calcium daily and for women who are 51 years and it is 1,200 mg daily. For men, the RDA is 1,000 mg of calcium daily for men age 70 and younger and 1,200 mg for men age 71 and older. One cup of milk only has 305 mg of calcium. A well-rounded diet consisting of fresh, whole foods and 3 meals a day can provide you with the calcium you need. To help bridge the gaps in your diet, calcium supplementation can be a wise tool. 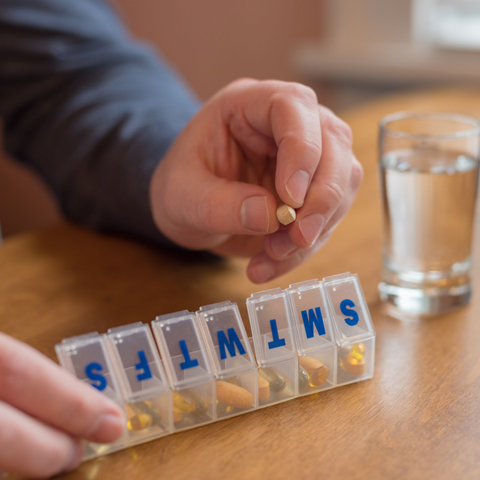 Choosing the best calcium supplement can be confusing, so use these tips to make sure you only buy calcium supplements the body can absorb and utilize. High Quality Calcium Forms: Coral Calcium, MCHC (Microcrystalline Hydroxyapatite), Calcium AEP, calcium fumerate, calcium malate, calcium ascorbate. Low Quality Calcium Forms: Calcium carbonate, oxide, gluconate, citrate, dicalcium phosphate, amino acid chelates. A Note on Tablets vs. Capsules: Be wary of tablets that claim you can get all your calcium in one or two tablets a day. These products contain low quality minerals and are usually compressed into tablet form and glued together with dicalcium phosphate, causing them pass through the digestive tract and into the toilet completely undigested. High quality minerals will always be in a loose powder form or a powder in a capsule. You may have heard that supplementing with calcium is useless to bones – potentially even harmful. This theory was born from flawed studies that used calcium supplements without pairing it with any of calcium’s partner nutrients vitamin D, magnesium, and vitamin K. These nutrients work with calcium to help it absorb into cells and be useful to your body! Vitamin D: Vitamin D improves calcium absorption, so it’s important to take a calcium supplement that contains vitamin D (RDA of vitamin D is 400IU/day). Many Americans are deficient in vitamin D. Statistics from the latest National Health and Nutrition Examination Survey (NHANES) demonstrated that more than 90 percent of people with darker skin pigments (Blacks, Hispanics and Asians) living in the United States suffer from vitamin D deficiency, along with 75 percent of the white population. Those who don’t see much sun during mid-day hours, with darker skin tones, or who live above the latitude of Boston, MA are especially at risk for low vitamin D levels. With so many Americans deficient in vitamin D, taking calcium along with a bit of vitamin D to enhance absorption is a wise choice. Magnesium: Magnesium is needed to activate an enzyme called alkaline phosphatase that is involved in forming new calcium bone crystals. Magnesium also helps regulate parathyroid hormone (PTH) and plays a role in calcium absorption. Magnesium is commonly lacking in individuals. A poor diet, stress, sweating, digestive issues, and numerous medications (blood pressure, diuretics, laxatives, methotrexate, antibiotics) block absorption or deplete magnesium. This is why you will often see magnesium and calcium paired together. Be sure to check labels for calcium and magnesium in the preferred 3:1 or 2:1 calcium to magnesium ratio. Vitamin K: Vitamin K acts as a traffic director telling calcium to go where it is needed. Focusing on calcium as the only necessary nutrient for bone health is like trying to bake a cake with just flour. Vitamin K is another partner nutrient to calcium and bone building, so be sure to pair it with calcium for healthy bones. Vitamin K1 and K2 are both useful forms of calcium for bone strength. The body can absorb about 500 mg of calcium in one serving. Take calcium in doses of 500 mg two to three times per day, depending on your diet and calcium needs. Supplementing with calcium at meals can help to enhance absorption. One reason for this has to do with the digestive power we have at mealtimes. It takes adequate digestive enzymes and stomach acid to absorb calcium. Another opportune time to take calcium supplements is before bed because of its ability to calm the nervous system and muscles. To help bridge the gaps of a well-rounded diet, calcium supplementation can be wise. It’s important to take care of your bones and build up calcium stores at every stage in life!